It was inexplicable. On December 22, the residents of Padyaljog village in Gadchiroli district wrote to the Maharashtra Forest Department seeking permission to harvest bamboo in two patches of forest granted to them under community forest rights (CFR). Four days later they wrote again complaining that the country’s largest paper manufacturer Ballarpur Industries was felling bamboo in their areas and requested to stop it. The department, in its characteristic manner, took a month to respond. 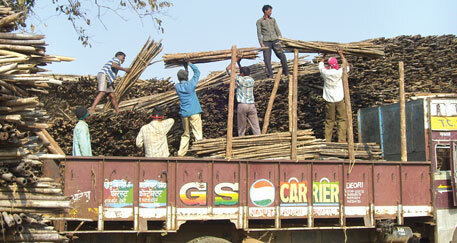 On January 25, it ordered the paper mill to stop felling bamboo in Padyaljog’s CFR area. In an unexpected turn of events, on February 5, the residents wrote to the department saying they were willing to give felling rights to the mill for the year because it had chopped the long bamboo into pieces, which they did not need. This was odd. By exercising CFR, they could have sold the chopped bamboo to the paper mill and earned closed to Rs 80 lakh. In neighbouring Kurkheda tehsil, Sheoni village residents had also applied for permission to harvest bamboo this season, but retracted after Padyaljog’s withdrawal. “Several villages in Korchi and Kurkheda tehsils were preparing to apply for felling bamboo. They have backed off,” says Keshav Gurnule, who runs a non-profit Shrushti in the district and has helped villages file CFR claims. But no one is willing to explain what spurred this sudden change of mind among Gadchiroli communities. They had strived to acquire the rights over minor forest produces like bamboo under the Forest Rights Act (FRA) of 2006, and earned the tribal district the status of clearing the maximum 298 CFR claims in the state. 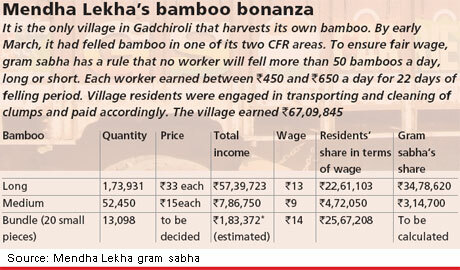 While the national media goes gaga over one village, Mendha Lekha, for its millionaire status by virtue of bamboo sale and the forest department holds it up as an example, little attention is being paid to the fact that no other village in Gadchiroli has been able to fell bamboo. “There is a lot of terror in these villages,” says Gurnule, shy of explaining what the terror is about. R M Ramanujam, deputy conservator of forests (DCF) of Wadsa division, whom Padyaljog residents had told their decision, says: “They refused to tell me the reason. But from their faces and manner I could gauge they were under pressure.” Pressed to elaborate, he said, “There can be only one kind of pressure”, implying the Naxals. Neither the administration nor social activists have visited the village since its surprising turnaround. Murkuti panchayat to which Padyaljog belongs witnessed two murders just six months ago. Requesting anonymity, several sources, including officials, inform Naxal movement in the vicinity of Padyaljog has intensified since the residents applied for permission to harvest bamboo. A close examination of the residents’ last communication with the forest department also reveals suspicious details. First, the letter was addressed to Ballarpur paper mill instead of DCF to whom it was directed; DCF was mentioned only in the list of those who were given a copy of the letter. This shows the letter was written under duress. Second, the letter stresses a seemingly irrelevant point that the village is united on the bamboo felling issue and cites the chopped bamboo as the only reason for relinquishing its rights. The letter also raises a pertinent question—why are Padyaljog residents yielding to Ballarpur paper mill if they are under pressure from the Naxals? Since 1968 the state has leased most of its bamboo to Ballarpur Industries. It continues to control the bamboo areas because the forest department has not bothered to cancel its lease in the compartments granted to villages under CFR. In November last, it gave the mill permission to fell bamboo in all patches ready for harvest without consulting gram sabhas. In Kurkheda and Kochi alone, 20 villages are unable to harvest bamboo. The residents are instead felling bamboos for the mill for a meagre wage of Rs 13 a bundle, which comprises 20 pieces of two-metre-long bamboo, an equivalent of five-six long bamboos. Had they sold it to private contractors they would have earned at least Rs 65 in wages for a bundle of five bamboos. “For each bundle the mill extracts, the gram sabha loses Rs 100,” Tofa says (see table). As per the forest department’s felling plan, Padyaljog is losing close to Rs 80 lakh this season. Lakshmipur in the same forest circle is losing Rs 2 crore. “The mill’s lease has become invalid in all CFR areas,” says Mohan Hirabai Hiralal, veteran forest rights activist. This is because Section 7, Chapter III of FRA states, “The forest rights shall be conferred free of all encumbrances and procedural requirements.” This shows the forest department is protecting the interest of the mill, Hiralal adds. Hiralal’s observation becomes clear during conversations with the top brass in forest department. A K Joshi, principal chief conservator of forests, who had told Down To Earth in April last that the mill’s lease would be cancelled in CFR areas, says there is no overlap between CFR areas and those leased to the mill. At a meeting with village residents and forest rights activists in Gadchiroli on March 9, Praveen Pardeshi, state forest secretary, accepted that felling order to the mill was a mistake. He said an order would be issued to cancel all leases in CFR areas and promised to recover the cost of the felled bamboo from the mill. But while talking to DTE, Pardeshi backtracked and said cost recovery is not an option as the mill’s lease is “also legal”. “Pardeshi should have made the point at the meeting so that we could have discussed the legality of the mill’s lease right,” says Hiralal. Such backtracking shows the government is not sincere about giving people their due, he adds. As residents wait for the mill’s lease to be cancelled, it continues to fell bamboo on people’s forests.